ALOHA Mind Math Centers gives 7 ideas to create Christmas holiday traditions as a family and maintain math skills and reading skills over Christmas vacation. It is best to plan ahead before the children ask for something to do. 1. Celebrate cultures and end of the year celebrations. Go to the library to learn about how other cultures celebrate the holidays. Write a summary and compare select ones to your own celebrations. 2. Visit a local museum. Most museums offer tours, while others offer learning and fun activities for children. Ahead of time tell the children to select three things to study during their visit. Afterwards they tell which three items were selected, why each were chosen, and talk about their three selections in detail. 3. See a festive play or musical. What a better way to get into the holiday spirit than attending “The Christmas Carol” or another fine arts performance? 4. Write thank you notes. Some children dread doing this so make it fun. Play Christmas carols, make hot chocolate, and help them write thank you notes to everyone who gave them a gift. If the child is too young, write it for them and help them hold the pencil and attempt to write their name. This is a becoming a lost etiquette practice due to email and texting. Sending a thank you is a business necessity and just as important in personal relationships. Besides everyone loves being the receiver of a thank you note. 5. 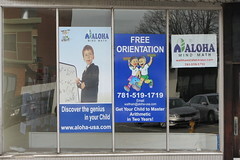 Take a tour of the local ALOHA Mind Math Center. Hours over the holidays may vary. 6. Turn looking at holiday lights into a math game. Maintain math skills while touring the neighborhood or city, count the number of reindeer and Santa Claus seen. For every reindeer they receive one point and for every Santa Claus they receive two points. 7. Create a book celebrating the year. Tell and illustrate touching moments, highlights, and lessons learned throughout the year. This activity maintains reading skills, writing skills, and relives special moments and milestones. The holidays can be hectic, then everything winds down and sometimes children get restless. Crafting plans ahead of time can make the vacation break run much smoother and bring the family closer together. Enhance children’s learning, improve and maintain math, reading skills, and writing by visiting the nearest center ALOHA Mind Math.